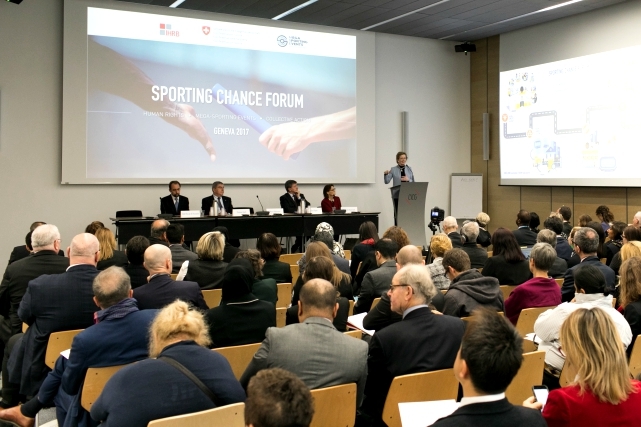 The second annual Sporting Chance Forum convened in Geneva, Switzerland from 30 November to 1 December 2017, hosted by the Swiss Federal Department of Foreign Affairs, the Institute for Human Rights and Business (IHRB) and the Mega-Sporting Events Platform for Human Rights (MSE Platform). The Forum brought together over 175 representatives from across many stakeholder groups to explore the human rights opportunities and risks associated with mega-sporting events (MSEs) and sport in general, and to assess progress made and challenges remaining since the first Sporting Chance Forum in October 2016. The Forum was opened by Mary Robinson, Chair of the MSE Platform Steering Committee, who announced a joint commitment to transition the MSE Platform to a permanent, independent Centre for Sport and Human Rights in 2018. The Forum also showcased draft work developed collectively by members of the MSE Platform, to further operationalise human rights principles by various actors in the world of sport. The draft tools were consulted on during parallel sessions of the Forum, and will be finalised and published throughout 2018. This meeting report offers an overview of the two-day discussions, as well as conclusions and next steps for the future Centre for Sport and Human Rights. The meeting report is also available in French. You can also watch the opening of the 2017 Sporting Chance Forum below, with remarks from: John Morrison, Chief Executive, Institute for Human Rights and Business; Mary Robinson, Chair of the MSE Platform Steering Committee; Pascale Baeriswyl, State Secretary of Foreign Affairs, Government of Switzerland; Zeid Ra’ad Al Hussein, United Nations High Commissioner for Human Rights; Guy Ryder, Director General, International Labour Organization; and Thomas Bach, President, International Olympic Committee.